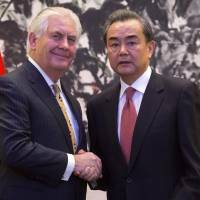 The possibility of a nuclear-armed Japan has again been raised by the Trump administration, after U.S. Secretary of State Tillerson appeared to say in an interview ahead of his visit to Beijing that, with “all options on the table” regarding the North Korean threat, “circumstances could evolve” in terms of Tokyo acquiring atomic weapons. In an interview Saturday with the lone reporter allowed to accompany him on his visits to Japan, South Korea and China, the top U.S. diplomat, who had previously dismissed the need for Tokyo and Seoul to acquire nuclear weapons, was asked if his views had shifted, given the surging tensions on the Korean Peninsula. For now, he said, Washington’s policy of working to rein in Pyongyang’s nuclear program remained unchanged. 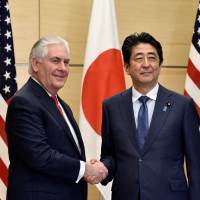 “A denuclearized Korean Peninsula negates any thought or need for Japan to have nuclear weapons,” Tillerson said during the interview with the conservative Independent Journal Review, his only remarks to the media outside of official events. The administration of President Donald Trump has come under fire for proposing to slash the State Department’s budget by nearly a third, as well as for the slow pace of nominating top officials. As of Friday, the Trump administration had yet to send a single nomination — aside from Tillerson — to the Senate for the department’s top posts. 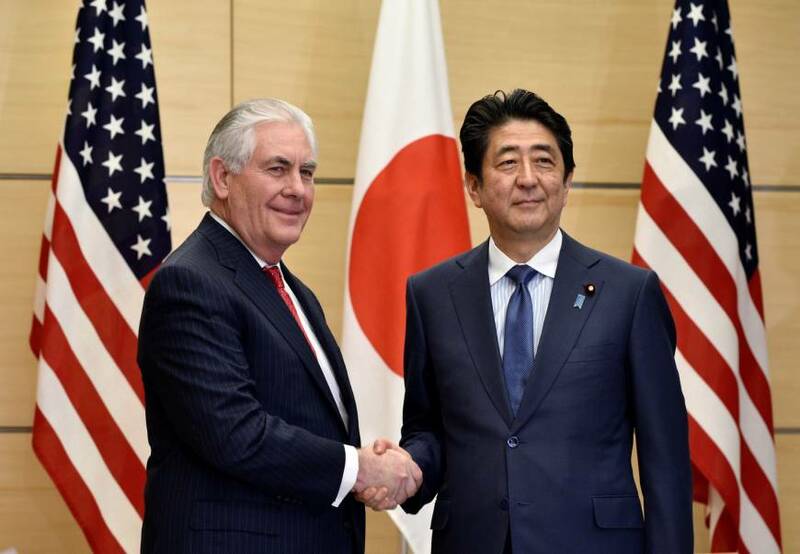 Bonnie Glaser, an Asia expert at the Center for Strategic and International Studies think tank in Washington, said Tillerson’s remarks on Japan acquiring nuclear weapons appeared to be a shift in thinking. 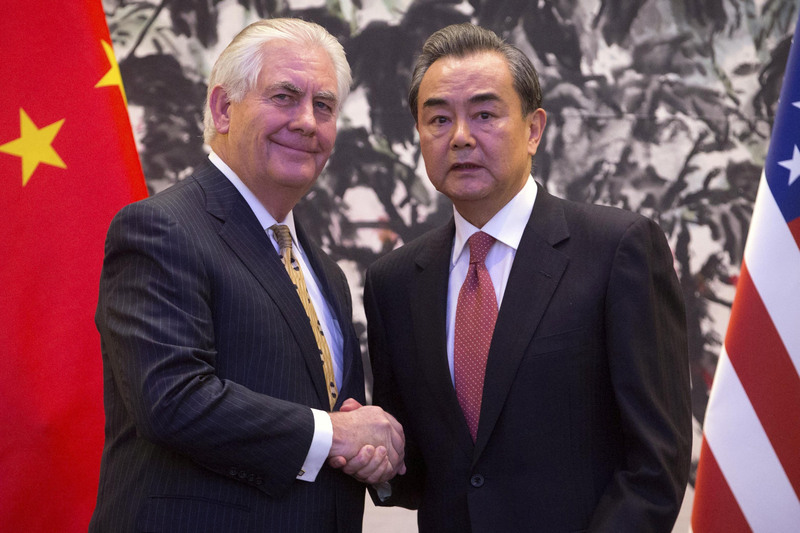 “It strikes me as a new position,” Glaser said, noting that President George W. Bush had warned China, the Pyongyang’s biggest patron, that if the North developed nuclear weapons, Japan and South Korea — and even Taiwan — might do the same. Trump and Tillerson have vowed to make a clear break from the policy of his predecessor, President Barack Obama, who pursued a policy of “strategic patience” to wait out the regime. Still, other observers chalked Tillerson’s controversial remarks up to simple inexperience and heightened concerns over the new administration’s often-time contentious moves. “This seems to be a combination of Tillerson’s inexperience, poor staff work and the extra scrutiny that goes with everything Team Trump says,” said Jeffrey Lewis, an arms control expert with the Center for Nonproliferation Studies at the Middlebury Institute of International Studies in California. Van Jackson, an associate professor at the U.S. Defense Department’s Asia-Pacific Center for Security Studies in Honolulu, said the secretary of state’s remarks highlighted the risk-fraught environment on the Korean Peninsula. “But even if that’s true, there are only two realistic paths open to the United States in dealing with North Korean nukes: preventive strikes, or some form of tacit acknowledgement that North Korea is a nuclear state,” he said. While he agreed with Tillerson that such a scenario remained far off, if it were to happen at all, Jackson did not rule the possibility out. Experts say that Japan, with a significant stockpile of plutonium and technical know-how, could build an atomic arsenal relatively quickly. However, most are quick to point out the numerous obstacles to such a move, including the pacifist Constitution, widespread anti-nuclear sentiment and the nation’s so-called three non-nuclear principles of not possessing, developing or introducing nuclear weapons into the country. Trump’s foreign policy approach, however, has left room for maneuvering on the issue. While on the campaign trail, then-candidate Trump lambasted the financial contributions by Tokyo and Seoul for maintaining U.S. military bases in their countries, saying he might withdraw American forces unless the allies coughed up more money to retain them. While Trump has backed off many of these statements in the wake of meetings with Prime Minister Shinzo Abe, including one in which he said Washington was “100 percent” behind Tokyo after North Korea’s simultaneous launch of four missiles into waters near Japan this month, other remarks by the U.S. president have raised concerns of a nuclear arms race, particularly in Asia. In his first comments on the issue since taking office, Trump said last month that he wants to ensure the U.S. atomic arsenal is at the “top of the pack,” saying the United States had fallen behind in its weapons capacity. “It would be wonderful, a dream would be that no country would have nukes, but if countries are going to have nukes, we’re going to be at the top of the pack,” he was quoted as saying.